Angels have such beatific faces, however they are depicted, and all with the same look. I begin to wonder if they are related; one big happy family; some pugnacious, some fallen, some a bit wishy washy. Catching sight of an angel – even in stone – having a damn good time is rare, not wishing to offend aficionados, I do believe, some days, especially when things go well, but usually think to call on them only when things do not. ‘Muriel’s name means “God’s perfume.” Her angelic responsibilities are said to include tending the plants and animals of Earth. She is often shown with a crown of flowers, which she lovingly places into the river of life. It’s said that when she is around, you may smell the subtle scent of your favourite flower. The title of the book, Murielle’s Angel, is complete coincidence, although I was thinking of angels in human form: people who are uncommonly kind, generous, brave, or have any or all of the virtues in spades and whose kindness, generosity, bravery etc. has an effect on others. 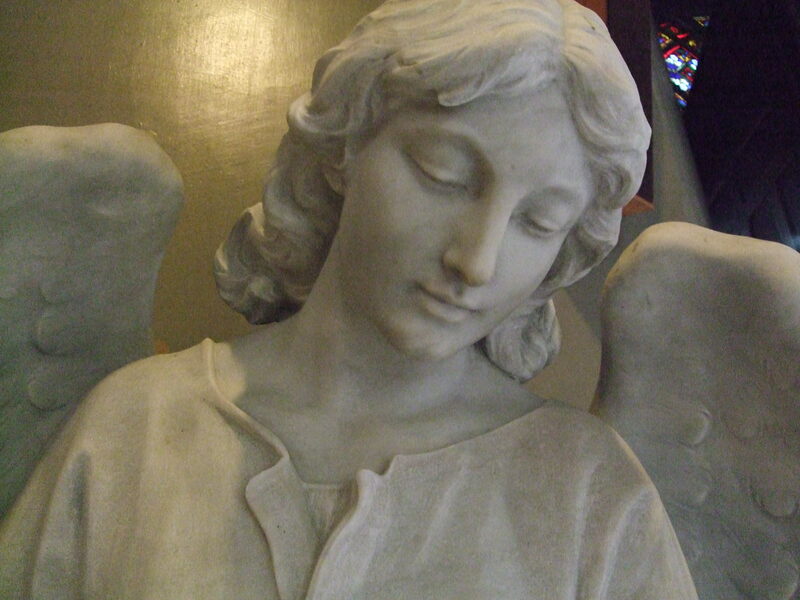 Perhaps the point of angels, in human form at least, is to foster the practice of virtues. It always seems if one person sets an example other try to follow. Perhaps we are back with random acts of kindness. It felt an enormous journey just to get here: Wales to Manchester to Bilbao to Irun. In Bilbao, we caught sight of the Guggenheim in its burnished splendour but did not go in. Sunny boy and the crowds were far more interested in the dismantling of the football stadium not far off. The crowd , some in full strip, photographed the slow progress of cranes and diggers dismantling concrete and metal bars edging closer to the iconic arch of their old stadium. No one knew if the arch would be taken down that day or the next but they wanted to be there when it happened. Nostalgia was palpable, the end of an era, of their childhood football dreams. The new stadium was well underway. A man we spoke to thought capacity would be 50,000 or so. Just before I could say it looked God awful, he told me it was muy bonito. Very pretty? No way. The first pilgrim we met in the Albergue in Irun, Alison from Namibia, had broken her foot. She talked of angels so I told her of my book. She made a note of the publishers, Cinnamon Press, as she too wanted to write. The second pilgrim, Paquita, a diminutive figure, carried a bright orange canary in a metal cage. Richard. She put the cage on a counter top and told him not to move. He didn´t. We saw her struggling with her burden the next day and then lost sight of her. By chance I saw a bright orange feather blowing in the gutter and kept it in the hope that, should we meet again and Richard had suffered some mishap, it may be of some macabre consolation.